Doge: Why we can't agree on how to pronounce the internet meme featuring shiba inus and terse grammar. Why Can’t We Agree on How to Pronounce Doge? A version of this post appeared on The Week. Wow such grammar. So teach. The doge meme: a shiba inu with artistically scattered, multicolored comic sans that has its own bizarre sort of grammaticality. But since it arose on the internet, it managed to get popular without anyone ever coming to a consensus on how to pronounce the word doge out loud. The best we have at the moment is this Slate poll that is entirely inconclusive: around 30 percent each for dohj and dogue (like “vogue”), plus around 10 percent each for doggie, dog-eh, and dough-geh, and 20 percent for “wow. such confused.” If pronunciations of doge were parties in a parliamentary democracy, we’d be in talks to form a really big-tent coalition government right now. So I can’t tell you the “right” way to pronounce doge, because we haven’t collectively figured that out yet. But I can explain why everyone is confused. Let’s start with how we normally figure out how to pronounce new words that arise from textual sources. Consider blog. It’s a word that started online, but there’s never been any great controversy about how to say it. Why is that? Normally, we figure out how to pronounce new words entering the language based on analogy with existing words. For blog, it was especially easy because everyone knew that it was a shortening of web log. So you take the pronunciation of log and just add a /b/ sound at the beginning. Easy. Moreover, blog looked a lot like a lot of other relatively common English words which all rhyme with each other, such as dog and flog and eggnog and so on. Any alternative pronunciations for blog never stood a chance. So, what happens if we try to pronounce doge by analogy with existing English words that end in -oge? I’ll give you a moment to think of some. That’s 11 words, and one of them is doge itself. Two of them, the words scrooge and stooge, are obviously not going to be helpful because “oo” signals an entirely different vowel. So we’re left with eight possible words to use as analogies: anagoge, apagoge, epagoge, gamboge, horologe, isagoge, loge, and paragoge. I’m a pretty well-read person, and I hadn’t heard of any of these words (these all fit OneLook’s definition of “common,” so you should see what its obscure words look like). Based on my knowledge of French, I correctly guessed that horologe was related to clocks, but that doesn’t get me any closer to knowing how to pronounce it in English. We could go look up these eight uncommon words and how to say them, but that’s not going to help the average person who’s trying to figure out the pronunciation of doge by analogy, so let’s see what other words we could reason from instead. There are two types of words that might be useful here: words ending in -ge, such as camouflage or beverage, and words ending in -o_e, where the blank is some other consonant, such as code or gone. You might notice a problem with these examples: For every possible analogy, there are several different but completely reasonable pronunciations. And matters aren’t helped by the multiple pronunciations for words ending in -ogue, such as vogue or catalogue, and -ouge, such as rouge and gouge. Perhaps in a year or two the dust will have settled and we’ll have arrived at some sort of consensus on how to say this tricksy little word. 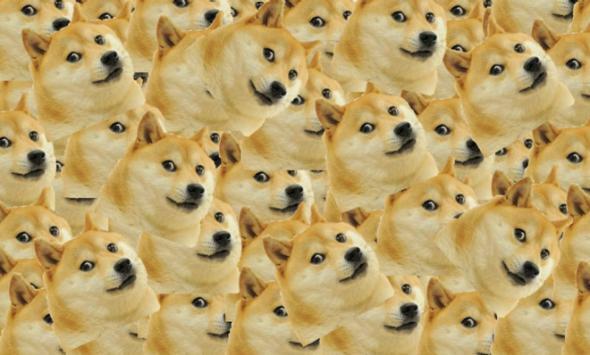 But for the moment, my Official Linguist Pronunciation Advice on the word doge is “You know that meme? With the shiba inus? Doh-something? Yeah, that one.” How do you pronounce it? Aunt, adult, pajamas: Why can’t we agree how to pronounce common words? What’s the correct pronunciation of February?